Hortus Camdenensis | Oenothera rosea Ait. Fully hardy, somewhat twiggy, shrubby perennial with ovate to lance-shaped leaves, pinnatifid towards the base, and profuse rose-coloured flowers, opening during the day, in summer. To 60cm. [RHSD, Hortus]. ‘Of the several different species of this genus growing in our garden at this present writing (eleven in number) two only are of a red or purple colour, the one here figured, and another with a larger flower, which we purpose to publish under the name of purpurea. The present species, Mr. Aiton informs us, was introduced in 1783 by Mons. Thouin, from Peru.’ [BM t.347/1769]. Listed in the 1845, 1850 and 1857 catalogues [H.169/1845]. Widely naturalised in Australia from Queensland to Victoria, including the Camden region. 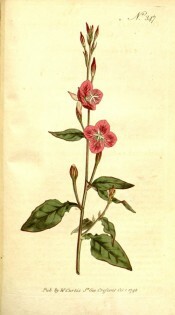 More details about Oenothera rosea Ait.